We also manufacture, export and supply a wide range of Handmade Envelopes. 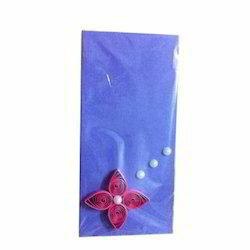 These handmade envelopes are attractively designed by our creative designers who are highly talented. We offer these products in a variety of designs, colors and sizes meeting all the requirements of the clients. Known for attractiveness and quality, our range includes Handmade Envelopes. Aimed at prosperous growth in this domain, we are instrumental in offering an excellent quality range of Quilled Paper Envelopes. We make quilled envelopes on orders. We have readymade envoleps to sell loose also. 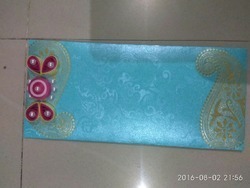 Paper envelopes decorated using quilling strips and various designs made out of it. Beautiful, attractive Paper Quilling Envelope decorated with paper quilled flowers or designs. Suitable for giving money gifts on Wedding and on other occasions.